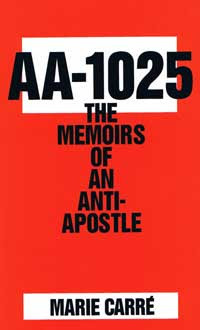 Several years ago I read a book entitled “AA 1025, The Memoirs of an Anti-Apostle”, written by Marie Carre. It dealt with a man who had been severely injured in a car wreck in France; Mrs. Carre was his nurse. The man carried no identification and was comatose. Upon his death, she opened his briefcase and there was a manuscript of sorts. After much soul-searching and many discussions with her Bishop, she decided to publish the manuscript. She gave the man the name “Michael” and her reason for publishing the manuscript was “…for the world to know why the Catholic church has been undergoing destructive changes to the lament of its faithful”. I believe this man died in 1968. An excellent synopsis of the book and background of “Michael” can be found here at “The End Days” under an article entitled “The Confessions of a Communist Agent on the Attempt to Destroy the Roman Catholic Church from Within”. Before I start hearing the conspiracy theories and WAY out there theories of the New World Order, etc., let me first clarify while I AM indeed Catholic, while I have indeed CHOSEN to revert to the Traditional Latin Mass over NOEL, while I am very well versed in my faith and have lived through the majority of the changes implemented since Vatican II and have observed first hand the destruction of the Church from within and am very familiar with the Book of Revelations, I don’t walk around with a tin foil hat waiting for the sky to fall, nor do I walk around with a sandwich board which proclaims “Repent–The End is Near”. I tend to believe there is always hope and have also CHOSEN to live my life fully, as God intended me to live, not constantly looking over my shoulder, waiting for the next disaster. That is NOT how God intended us to live our lives. That being said, with Snooper’s article below, which he has published a few times before, there are certain things in the Communist Manifesto and in this book that correlate, similar things on the “lists”–and I don’t believe in coincidence. At the time of Vatican II (which opened under Pope John XXIII in 1962 and closed under Pope Paul VI in 1965), this country was going through major upheaval–our first Catholic president, the Bay of Pigs, the Cuban Missile Crisis, the Civil Rights Movement, Vietnam, the Space Race–not to mention the assassinations starting with JFK–the self-same first Catholic president. As a country, we were losing our innocence and losing it quickly. The Vatican itself was–and is– a concentration of a huge amount of wealth, both in monetary terms and influence over a large segment of the world’s population. Even forgetting the Catholic faithful, the wealth alone was a worthy target for a country needing funds–the USSR. If the Church itself could be infiltrated, it would be a bold coup and could be accomplished without bloodshed (for the most part–there WAS that “pesky” Pope John Paul I who had decided to “roll-back” many of the disastrous changes Vatican II had wrought). It would net access to the enormous wealth and influence over the faithful. That influence, over a populace who (for the most part) did not question their spiritual leaders, was priceless. Those that did question their spiritual leaders (such as Americans were learning to do) could be dealt with by implementing leaders “hand picked” to continue the infiltration. From the website referenced above, we see some of the manuscript which was eventually published. Keeping in mind “Michael” died in approximately 1968, these passages can be chilling. All emphasis is mine. “Such is the compendium of the orders which I sent throughout the world. That’s an awful lot of red. Further, what isn’t red (meaning it has yet to happen) has at least been attempted in the near past; in some cases (such as marriage of priests; ordination of women; birth control, abortion and euthanasia) it is still being advocated. If you look closely and carefully, you will see the emphasis put on the secular “Man” as divine, rather than than the Triune God. We see this on the left, in agencies such as the ACLU, in faux civil rights agencies such as CAIR…it is happening, just as this man and others like him have planned. Policies are designed to lull the gullible into acceptance of anything and everything as “normal and healthy”, with no consequences–and to our danger. We are no longer taught to discern (to discern means to think, evaluate and take appropriate action rather than blindly follow). In the NOEL Mass (“Novus Ordum”), Holy Communion is distributed in the hand, the Mass is said entirely in the vernacular while facing the congregation, lay people and women are on the altar, you do not kneel for Communion, dress is remarkably casual, no emphasis is put on Confession–in fact, 46% of the Mass was changed. Until that time, from the time of the Last Supper until Vatican II, only EIGHT WORDS had changed. The prayers at the end of Mass were eliminated, there are no more Gregorian Chants or organ music. Priests became your “friend” rather than your spiritual leader; nuns no longer wear their habits or even their rings signifying their marriage to Christ. There is no censure for publicly breaking away from doctrine (Kennedy? Kerry? Pelosi?). Everything is explained away; God is no longer a “Just” God, He forgives anything and basically there is no accountability for your actions. There is no more emphasis on morality, right or wrong. There aren’t a lot of people left who even know what the Triduum is. Again, emphasis is put on the wishes and desires of “Man” and the “secular” rather than Doctrine. This negates the need for any relevant soul-searching and no one feels guilty about anything–they have no moral compass with which to feel guilt or remorse because none is taught. It’s not “popular” to preach right and wrong, Heaven, Hell, Purgatory or Judgment. It’s acceptable to sit in judgment of others (I KNOW where I’m going when I die–I KNOW you’re going to hell; that kind of thing). It’s not “popular” to preach about how our political leaders are leading us. In fact, it could be downright dangerous and the Church could lose tax status for that (Pelosi). It’s extremely unpopular, extremely dangerous and might “offend” someone to tell the truth about our current political leaders and how they are leading us into moral danger. The Church has bought–lock, stock and barrel–the political correctness agenda. No longer is it the Church not only of love, but of Jesus’ righteous anger in the temple. As the current “vernacular” states: “It’s all good”. Unless–UNLESS–you attend a Tridentine Mass. Those are difficult to find as they are not offered in all diocese. 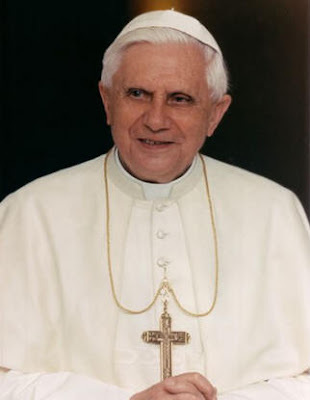 Fortunately, Pope Benedict XVI has issued a proclamation wherein the Bishop of any diocese no longer has to wait years for permission to perform the Tridentine Mass–they are now able to offer it without waiting for permission to be granted. I happen to live in an area where there is an entire parish dedicated to the Tridentine Mass. The “old” strictures apply–no reception of Holy Communion without first receiving Confession and Absolution, reception of Communion at the KNEELERS at the altar rails (some Churchs have reinstalled the altar rails and kneelers), altar boys only (no boy and girl “altar servers”), a Gregorian choir, organ music, no lay people or women on the altar, dress codes enforced, women have their heads covered. There are also a very limited number of priests trained to properly pray the Tridentine Mass. However, those priests are gold. They are, as they say, “old school”; they tell it like it is, regardless of the personal cost to them. They turn excuses back onto the excuse maker and hold up the mirror–excuses are not acceptable if you have been raised in a Tridentine atmosphere. These priests preach the old way and are not afraid to speak out about the political abominations we have in office or the policies being forced down our throats. Wait a minute–women have their heads covered??? Isn’t that a muslim thing? No. Even in ancient times women covered their heads in the presence of the Divine. It is a sign of respect, at least in the Catholic church. I don’t know the meaning of it in islam. Further, the first time my son showed up in shorts and tennis shoes (he just WOULDN’T listen and he had been a MASTER altar boy in the NOEL Mass), he was not allowed in the Mass as his dress didn’t show proper respect. That was the only time–since that time (and after being publicly humiliated for his lack of respect) he has dressed as he did as an altar boy–button down shirt, slacks, dress shoes, often a tie. My daughter, who wanted to dress in a similarly casual manner, saw her brother humiliated and decided she would listen. She wears a dress (hemline to the knees), tights, dress shoes and her head covering (her coverings are lace and match her dresses). All of this shows respect for what the Mass MEANS–the Bloodless Sacrifice of Our Lord, the worship of God. It’s also had an amazing side effect–by learning their Latin, they have an easier time in their Spanish classes. The languages are remarkably similar. By growing up in a transitional time of the Church, I’ve had a first hand glimpse of how easily it can be infiltrated from the INSIDE. However, the people, those who refuse to study and learn, follow along like sheep, losing their sense of the Divine along the way, and giving in–knowingly or not–to a plan similar to the plan being implemented upon the people of this country. Vatican II did amazing damage to the Church–seminary applications dropped significantly, leading to the closing of many seminaries. Convents suffered the same fates. Many of the older generation refused to attend the NOEL Mass (my mother was one of them). It wasn’t “their” Church anymore; they didn’t recognize it. Therefore, church attendance dropped like a stone. The suppression is failing. Ultimately, as with all other attempts at Communism, it is failing within the Church itself. It cannot fulfill the need of the human, the TRUE human, for the touch of the Divine, of something greater than ourselves and outside of ourselves. I see true hope in that. As the Church has stumbled and fallen, She has also picked Herself up, dusted Herself off and appears to be making a strong comeback. But only through the determined effort of a generation who lived through the original transition. We didn’t like the changes made–and we are refusing those changes now. We want the Church back, in all Her glory, with all Her meaning. Not the pablum foisted upon us by Vatican II. So too with America. As the Church went, so the politicians have tried–and continue to try–to take the country. As the Church goes, so also goes the country–with the conservative upswing and the conservatives coming out of their stupor, refusing to continue in their role as the “silent majority”. As the Church goes, so goes the country. The country would be well advised to look at the damage done to the Church by the infiltrators and take its cue from the Church, Her stumble and Her ultimate refusal of the infiltration. In that regard, study “Michael’s” “plan”–compare it to the Communist Manifesto. They are not separate issues. One serves as warning to the other. As the Church goes, so goes the country. God help us all, because that being the case, we are in for a literal hell on earth–unless people stand up NOW, come out of their stupors and say, loud and clear, WE WILL NOT TOLERATE Communism here on our shores. Unless WE THE PEOPLE stop it dead in its tracks and stop it now. I have posted A Common Word: Islamic Extortion Scheme! at Snooper’s. There’s more than just the letter. There is an introduction and summary, plus King Abdullah bin Hussein’s message. Links are in the post. Abdullah and the Ulama are up to the usual tricks. Al-Taqeyya!!! Plenty of quotes, and more counter evidence than you want to see. Chapter & verse + Tafsir & Fiqh. Botom line: an indirect way of saying “Embrace Islam and you will be safe.” Of cuss, if you don’t there’s a war on. They sent the Goddamn thing to the Pope and a slew of prelates. They claim common ground which does not exist; its quicksand. It appears that their web site may be affiliated with altafsir; it seems to be Shi’ia oriented and they have a link to altafsir. There is mention at the Guardian & NYT as well as BBC. It was also mentioned on Coast 2 Coast AM. Robert Spencer has posted an initial skeptical reaction. Mine is not so gentle.